The Medium size accommodates Bibles such as the NLT Reference Editions, Daily Study Bible for Women and The Life Application Bible - Personal size, or other books and Bibles up to 156 x 224 x 40 mm. Trust (Black) Micro Fiber Bible Cover- Medium was published by Christian Art Gifts in January 2003 and is our 18852nd best seller. The ISBN for Trust (Black) Micro Fiber Bible Cover- Medium is 6006937102644. Be the first to review Trust (Black) Micro Fiber Bible Cover- Medium! Got a question? No problem! 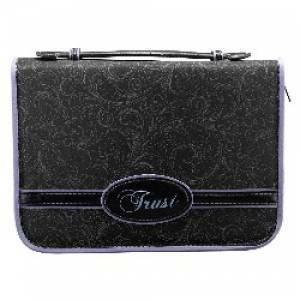 Just click here to ask us about Trust (Black) Micro Fiber Bible Cover- Medium.